Audi's all-electric and self-driving flying car takes flight. A collaboration between Audi, Airbus and Italdesign has led to an all-electric, self-driving flying car called ‘Pop.Up Next’. 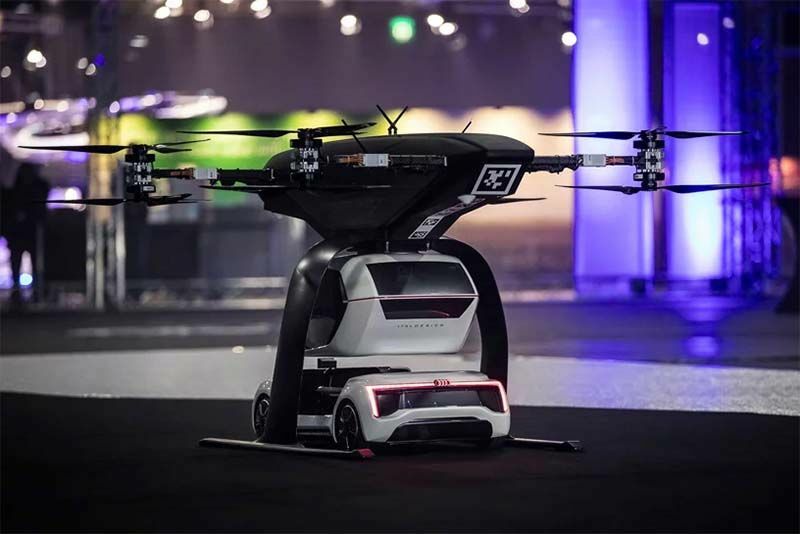 And it's not just the stuff of dreams, there is currently a 1:4 scale prototype being tested that was on display at Drone Week in Amsterdam recently after they unveiled the concept at this year's Geneva auto show. So, let's just recap on the Pop.Up Next, shall we. If you weren't paying attention in the first paragraph, we're talking about an autonomous car/drone hybrid vehicle – a car that flies. By itself. Let's run through how it all works together. First, there's a two-seat passenger capsule, a separate four-rotor drone, and a detachable pod that holds them together. The drone connects to the top of the pod and autonomously flies to wherever the electric vehicle frame is. Visitors to Drone Week got to witness the first public test flight, where the flight module landed the passenger capsule perfectly on the ground module, which then drove away autonomously. President of the Audi subsidiary Italdesign, Dr Bernd Martens, says, "Flying taxis are on the way. we at Audi are convinced of that. More and more people are moving to cities, and more and more people will be mobile thanks to automation. In future, senior citizens, children, and people without a driver’s license will want to use convenient robot taxis. If we succeed in making a smart allocation of traffic between roads and airspace, people and cities can benefit in equal measure." Audi says it's currently conducting tests in South America for flying taxi services in large cities that use this multi-modal operation and are also supporting the urban air mobility flying taxi project in Ingolstadt. This initiative is preparing test operations for a flying taxi at Audi’s site as part of a joint project with the European Union. The project is looking to prove to the public that this new technology is beneficial, as well as answer questions regarding battery technology, regulation, certification, and infrastructure. "In the future, flying taxis will appeal to a wide range of city dwellers. With pop.up next, we are simultaneously exploring the boundaries of what is technically possible. the next step is for a full-size prototype to fly and drive," said Dr Martens.